Well bully for you, "crushing teams", glad to see you have such disrespect for clans in the "lower" tier tournaments, you must be very proud of yourself and how exceptionally brilliant you think your clan is. We played a couple of tier 8 and 10 tournaments at the end of the season, and apart from losing a couple of times we "crushed" most teams we played as well, just weren't used to the tournament map/tank meta on those tiers as we had been at tier 6, and when we meet teams like -1-, well we don't expect to do so well! The point here is that not everyone in tier X tournaments is an eSports pro team, and not everyone in tier 6 tournaments are a bunch of useless noobs not worthy of your time and consideration. Let's try not to be elitist and have a bit of consideration for players choices instead. Here's a screenshot of your clan losing a 2nd round tier 6 game vs - WRP- a week or so before the end of the season. Anything to add? Rewards are still so small. We got 700k credits for 2 hours of playing (first place). It’s really better to play with 8t premium than these “quick” tournaments. They didn’t used much of the taktiks and Tricks used on t10. We haven’t seen one single fastcap, trap, countering of our try to cap ore even simple rotation. They even didn’t really tried getting map control. It felt like every tactic was to put some arls on the heavy side of the map and some meds on the med side. Than they would rush the side where they had more tanks. Quick tournament are the alternative from random battles game mode. We don't want to make rewards there bigger and we would not like promote it as a game mode for gathering a lot of in-game resources. Depending on map and tactics, we'll go Kuro, we'll use Cromwells, not a problem. There were so many clans playing Tier 6 that you might not have met a good team. Also remember some clans were fielding 3 or 4 teams per tournament so were given a captain and some basic instructions to get cups. Player turnover was immense and time for training? Forget it. We played against several high ranked clans and they all played the same stupid tactics. And why shouldn’t give the top team tactics to the 2. , 3. ... Team? Maybe these clans aren’t not skilled at all but on t6 they are successful with their crapTaktik so they don’t have to improve their taktiks. i’m Guessing your like still in school.....just try to accept that there are good clans in all tiers, it’s not hard you know. You’ll grow up to realise that people want different things from the game, they have more fun in the tier 6 tournaments than tier 10 beacuase the tanks are more fun to play. yes, there are really great clans in the tier X tournament, but there are in tier viii and vi as well. Try not to go around belittling the other tournaments because you think your the best, it’s not big and it’s not clever. Just a quick question to WG for an update on when the event camo will be awarded.....we still haven’t seen anything yet! Delay in this case caused with rewards for the Spring Season. Some players get more crates than planned and little more interesting situations. We are looking why this happened and after that all who must to get a camo - will get it. I think it will be on this week. Thanks. Yes we did notice crate rewards were higher than expected.....just thought you liked us! what about next weekend off season championship tour, that starts Friday 18th. The same evening is also normal off season tournament. Why are there 2 tournaments on same Friday same time? Some players don't like classic tournaments, but like quick tournaments. So it is an alternative. Player could choose what they want to do. this is exactly the point, players have another cw option for Friday. To do classic tour fri-sat-su the players need to commit for 3 evenings. 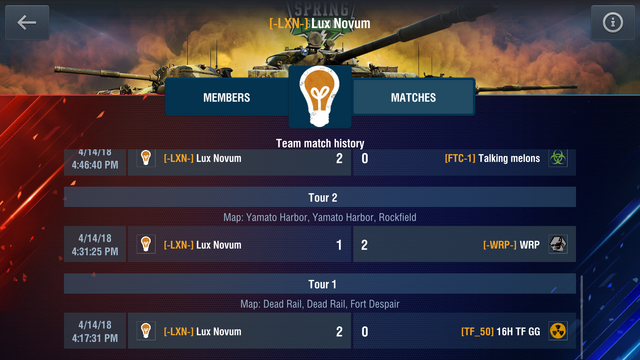 I fear these 2 tours compete too much on the clan’s player pool. Quickies are every day - is there really need to have one quicky also same day as tour? For this time - why not? In future we could change it. Hi WG, Still haven't received the Spring Series event camo, any news on the date you will distribute it please. Hmmm. It should be on your account, but seems like something was wrong and you don't got it. We will do it with next micro-patch which will be in few days. When it will come, you should re-login in game and after that you will get it. If not - come to us, we will help you. Hi again WG.....still no sign of the camo from the spring series tournament. You can use my account to look into why. I had over 7000 cups in tier 6 tournaments and there were at least 12 other players in the clan well over the threshold to receive it as well. Players like widd1, metaters, SmartFarts to name a few. How will we be informed when it is awarded, and do you have a picture of what it looks like? I appreciate you’ve all been busy getting the latest update out, but now that’s done could you sort this out for the loyal players who achieved the reward please. Edited by stubbo66, 27 May 2018 - 02:52 PM.